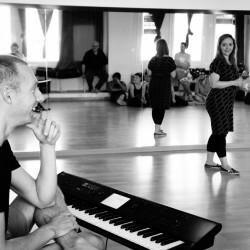 As well as teaching improvisers to sing we love to help singers to improvise. We have helped many singing groups dip their toes into the water of improvised group singing. Our emphasis is on fun and creativity and our approach is gentle and geared towards building the confidence of choir members for performance - improvised or not! "Joe and Heather, without previous introduction to the group, created a warm and trusting atmosphere in which we felt able to relax both as a group and as individuals. It encouraged us to explore our potential to improvise sounds and words to perform immediately rewarding songs. It will without doubt, allow me to contribute more confidently to improvisation sections within certain of the songs we sing as a choir. Altogether a positive and fun experience."